Halmatic 44 of the Nelson design. Built in 1986 as a fisheries protection vessel and coded to work up to 150nm offshore. It was then purchased by the RNLI in 2003 and completely refitted by South Boats, including new Caterpillar 3208 engines. Very substantially built and comes with masses of equipment and spares, (including most of the engine gaskets and a complete new set of injectors and all the filters/belts/impellers). The boat had been stored ashore for the last 2 years, and as such is out of code but subject to inspection should have no issues going straight back into service as all of the kit is still on board. The boat is now back in the water and fully re-commissioned. When in service with the RNLI she has been Coded for between 8 and 12 people on the YDSA scheme. Latest twin set up plotters, with integrated radar, ais and DF using raster or arcs charts. 2 sailor VHF radios, separate Furuno GPS Raymarine depth sounder. There is approximately £25,000 of electronics on board this boat. Engines are 280hp and only have 3200/3500 hours on them and are very tidy, with dual station ZF electric throttles. Twin Separ fuel filter set up on both engines with changeover. Engine driven general service pump that can either run the fire main, or bilge pumping duties. Pump outs for both engine and gearbox oil. New starter batteries just fitted. All of the engine and gearbox anodes have just been changed. 3 fuel tanks with a total capacity of just over 1600l. There is also a set of brand new spare propellers included in the sale. Accommodation: V berth forward for 2 then there is a pilot berth above the dining table. The table can also be dropped to make a double, so there is the possibility of accommodating 5. Large galley with fridge and hot and cold running water supplied by calorifier or immersion heater. Inverter provides 240v power afloat. 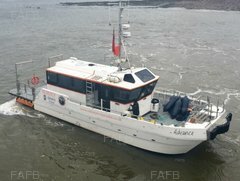 Wheel house has cab seats for 5 and a large chart table at the rear. Heads has a manual Jabsco toilet with holding tank. There is also a shower. Heating is provided by a Webasto diesel heater and also engine powered radiators when under way. 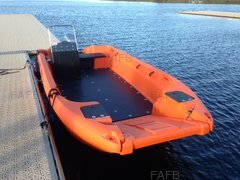 Very large lazarette which contains the bilge pumping valve chest, kedge anchor, emergency steering tiller, window boards and spare fuel cans. There is a 24v capstan on the aft deck which used to be used for recovering the tender. Fixed fire fighting for the engine room, and fire detection throughout the boat. Very sturdy, seaworthy boat which will reach 20 knots with these economic engines, and cruise at 17 knots. 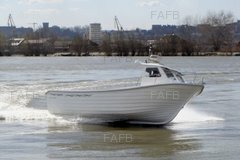 A versatile boat that could go straight back into service as a work boat, or make a very impressive leisure boat. Inspection and sea trial available most days.